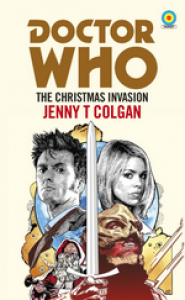 Colgan Captures the 10th Doctor's First Adventure Perfectly in this adaptation. Back in High School, I remember attending an author event -- some SF author that I'd never heard of (you probably haven't either), but what did I care? He was an actual SF/Fantasy/Horror writer visiting Idaho (it happens a little more now, but back then I hadn't thought it was possible). He discussed getting to write a novelization of a major Horror film thinking, "How hard can it be? Take the script, throw in some adjectives and verbs -- maybe a few adverbs and you're done!" He then went on to talk about all the things he learned about how hard it was taking a script of whatever quality and turning it into something that works in an entirely different medium. That's really stuck with me for some reason, and I've always respected anyone who can pull it off well (and even those who get close to doing it well). Before I babble on too much, Colgan is one who can pull it off pretty well.I discovered Doctor Who a couple of years before I saw that unnamed SF author, but didn't get to watch much of it, mostly because I lived in about the only place in the States where PBS didn't air old ones. I saw a few Sylvester McCoy episodes (mostly due to the magic of VHS and a friend who lived somewhere with a better PBS affiliate). Other than that, it was the small paperback novelizations of episodes. I owned a few, the same friend owned a few more -- so I read those. A lot. Then comes Russel T. Davies, Christopher Eccleston, Billie Piper, etc. and all was better. But I still remembered those novels as being Doctor Who to me. So when they announced that they were re-launching that series this year, I got excited. I own them all, but I've only found time to read one -- I started with Jenny T. Colgan, because I know how Paul Cornell writes, and I assume I'll love his -- ditto for Davies and Moffat. Besides, The Christmas Invasion is one of my favorite episodes ever. I won't bother with describing the plot much -- you know it, or you should. On the heels of regenerating into the 10th Doctor, Rose brings a mostly unconscious stranger into her mother's apartment to recuperate. At the same time, an alien invasion starts -- the British government -- under the direction of Harriet Jones, MP -- and the Torchwood project tries to respond, but really is pining all their hopes on the resident of the TARDIS. Colgan does a great job bringing the episode to life -- I could see the thing playing out in my mind. But she doesn't just do that -- she adds a nice little touch of her own here and there. Expands on some things and whatnot. In general, she just brings out what was there and expands on it. Adds a few spices to an already good dish to enhance the flavors. Colgan absolutely nails Rose's inner turmoil about who this stranger in her old friend's body is. I particularly enjoyed reading the scene where the Doctor emerges from the TARDIS, finally awake and ready to resume being Earth's protector -- between Rose's reaction, the already great dialogue, and Colgan's capturing the essence of Tennant's (and everyone else's) performances in her prose. Seriously, I've read that scene three times. I never do that. I'm not particularly crazy about the little addition she made to Harriet Jones' downfall, but I get it. I'm not scandalized by it or anything, I just didn't think it was necessary. Other than that, I appreciate everything Colgan did to put her stamp on this story. If the rest of these books are as good, I'm going to be very glad to read them, and hope that there are more to come soon.